Surveys have shown that 70 percent of organizations have had to change their network infrastructure to support hybrid cloud. Unfortunately, no matter how optimal your local data center performs, it is not inherently designed for the cloud. Therefore, it is important to have a thorough understanding of the preliminary steps that are required to see this transition through, which are laid out in this blog post. The most important thing to remember is that the cloud is merely an extension of your existing network. Because of this, users will expect the same level of access and performance they have grown accustomed to within the local network. Issues such as latency, congestion, and downtime are as important as ever. However, if you plan on accessing your cloud extension, you need to upgrade your WAN’s pipe. Even if you currently can’t take full advantage of it, a 10 GB connection should be implemented between your data center and your cloud provider. This requires that any switches, web content filters and firewalls must have 10 GB interfaces in order to accommodate this level of bandwidth. There are many things you can do to protect your company assets and data in the cloud; here are the most common cloud security mistakes and what you can do to fix them. Many organizations choose to utilize their public internet service to access their cloud resources. Although this is a popular choice from both cost perspective and design simplicity, it isn’t the most reliable, secure, or efficient option. A public Wi-Fi connection is in fact public, inferring that data transfers will have to compete with the traffic of others, which can create security concerns for any confidential data that is regularly transferred. To avoid potential security issues, some organizations choose to employ a direct connection between themselves and their chosen cloud provider; such direct connections are typically provided by a telecommunications provider. To make things simple, many of the major cloud providers such as Amazon Web Services, Microsoft Azure and VMware already offer these types of private connections through a partnership with a national provider. Another option is an Internet Exchange Point, a high-speed link between the two independent networks. Redundancy should always be considered in any network topology and the hybrid cloud is no different. Whether you choose to connect to your cloud resources through your ISP’s connection or a dedicated connection, you should establish a second connection as well. Your cloud provider may also provide a VPN connection that can be utilized as a backup link in case of failure. Proper planning and the implementation of the necessary equipment and tools will make your hybrid cloud operations perform as efficiently as they would within a single geographical network. Our engineers work with clients to integrate corporate strategy, new technologies and their current IT environment into one company-wide model to increase utilization and efficiencies around their unique business processes. 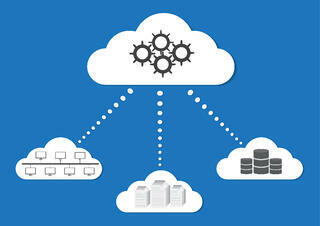 Stay tuned for more network considerations when moving to the hybrid cloud. In the meantime, contact WEI today with questions or to get a hybrid cloud plan started for your organization!